From spherification to the perfect Espresso, find out how ita��s done at Lavazzaa��s training centre in Guindy. ALL you Espresso-obsessed can now brew that perfect cuppa at home if you just get back to the grind. Wea��re referring to Italian coffee major, Lavazzaa��s new training centre in the city, where you can decode the beans, infusions and gleaming espresso machines and grinders ($3,500 onwards). The first in the country, located in Guindy, it can accommodate five to 20 people per session and covers everything, from the plant to cup process, demystifying Espresso and Cappuccino, and special recipes. But first, you are offered a seat and a sensory analysis. Francesco Viarizzo, manager of Out of Italy training centres (there are close to 50 at present) and in India on his second visit after 2008, wastes no time in opening up his a�?Green Coffee boxa��. Letting you sniff and identify aromas ranging from almonds to cookies, dark chocolate and cinnamon, he leads you through the Kafa region, the heart of Ethiopia from where coffee gets its name, to follow the spread of coffee cultivation, from Africa to India, Java, Central America and, finally, to Brazil. Indian coffees from the South, he adds, contributes a hint of chocolate and spice to Lavazza blends. This done, Viarizzo gets to the fun part a�� coffee design. Having worked with Ferran Adria of elBulli fame (it was ranked five times as Best Restaurant in the World), for years, he gives us a quick demo of the Spanish chefa��s trademark molecular technique, the spherification. With espresso and a calcium chloride bath, Viarizzo sets about creating glistening caviar that fairly explodes on the tongue. Therea��s Coffeetail, with premixed potions for a refreshing iced beverage. And wea��re yet to begin on the hulking machines waiting patiently. 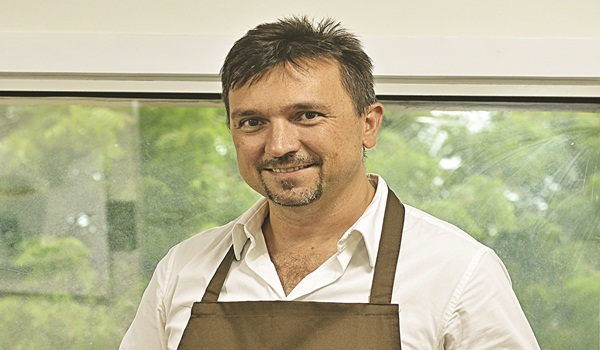 Viarizzo, 44, promises that participants at the workshop, lasting four hours to a day, will not only learn the intricacies of real Italian espresso but latte art too. The training, open to prospective clients and baristas is yet another effort to grow a brand that is already a powerhouse a�� it serves 20 billion coffee cups a year, going by a report in The Telegraph! Collaborations with master chefs like Massimo Bottura and Adria have resulted in treats like Passion Me (a soft drink made of passion fruit juice and espresso) and rapissino (a ganache of hazelnut and celeriac served with a coffee grissini). With Milana��s Carlo Cracco, they have created a tribute to myopia, Coffee Lens. It is used to serve warm rice cream and sea urchins.